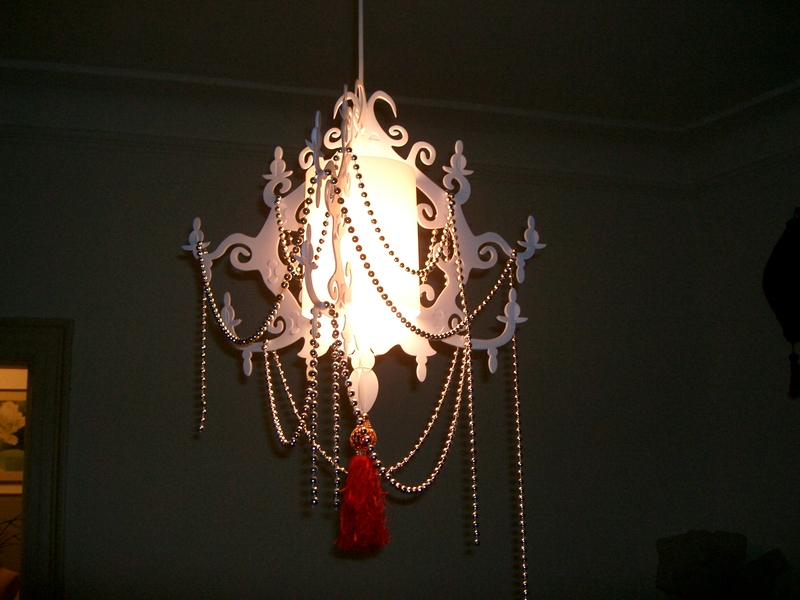 Pimp your Chandelier – Christmas up yourself! 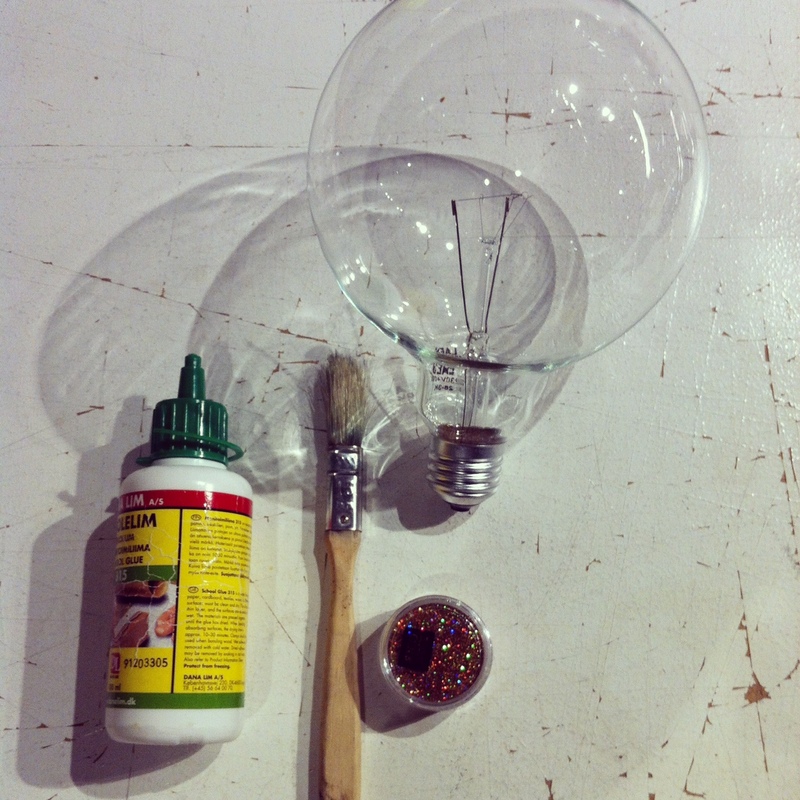 Here’s how I made a glitter bulb that looks like a bauble. A bit of white glue, a brush, and a bit of glitter. 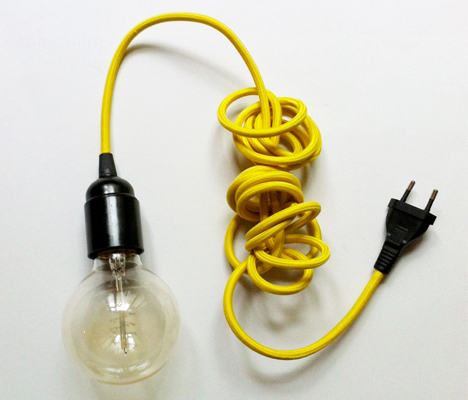 Paint the glue on your bulb (don’t recommend using more than a 40 watt bulb). 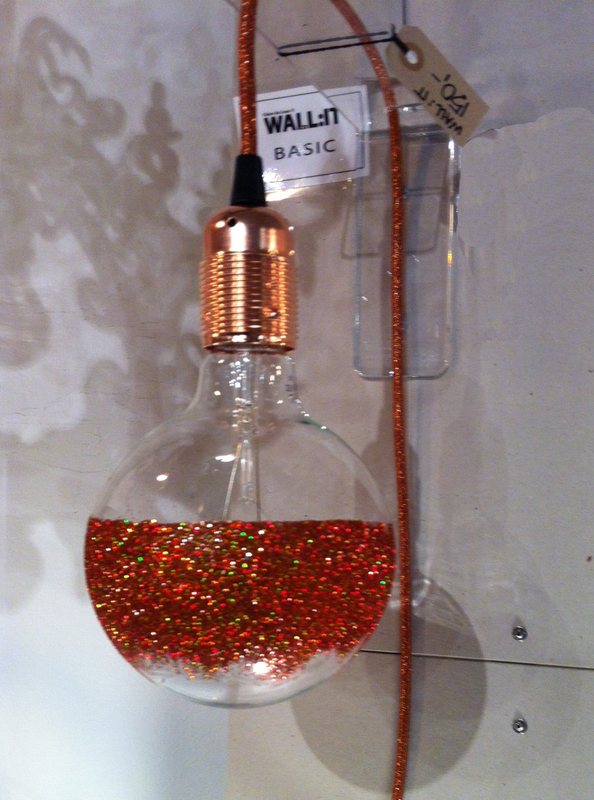 Right after, shake the glitter all over the bulb where there is glue, and voila! But if you don’t get to make your own glitter bauble, try one of our other Christmas products from our Etsy shop (accentcph). 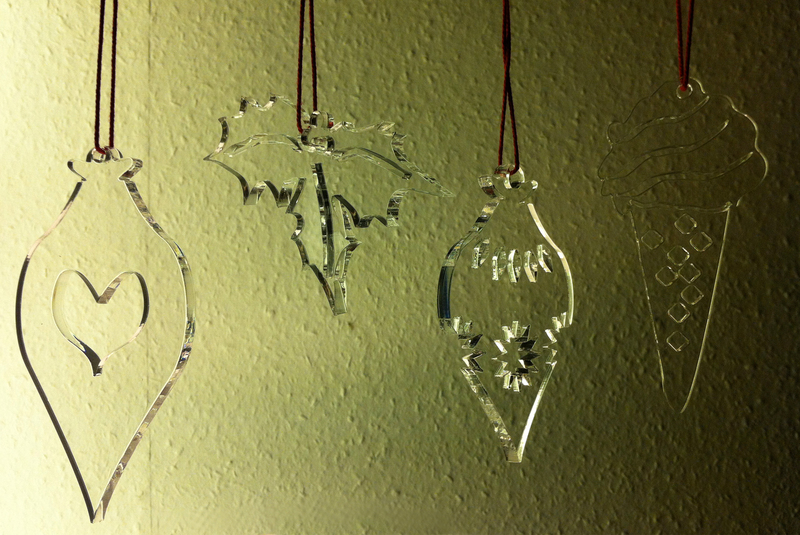 We have a line of Christmas products – called CHRISTMAS TIME. 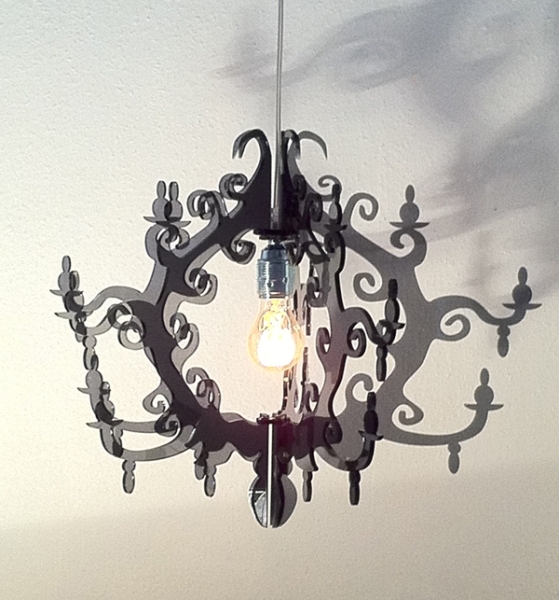 They include baubles made of upcycled acrylic – made from the leftover of our production of Claire de Lune Chandelier. We added two new products this year – Merry Christmas in three languages (Danish, English, and the middle language French, Spanish and Russian), and Three Wise Men. In clear transparent and transparent grey. 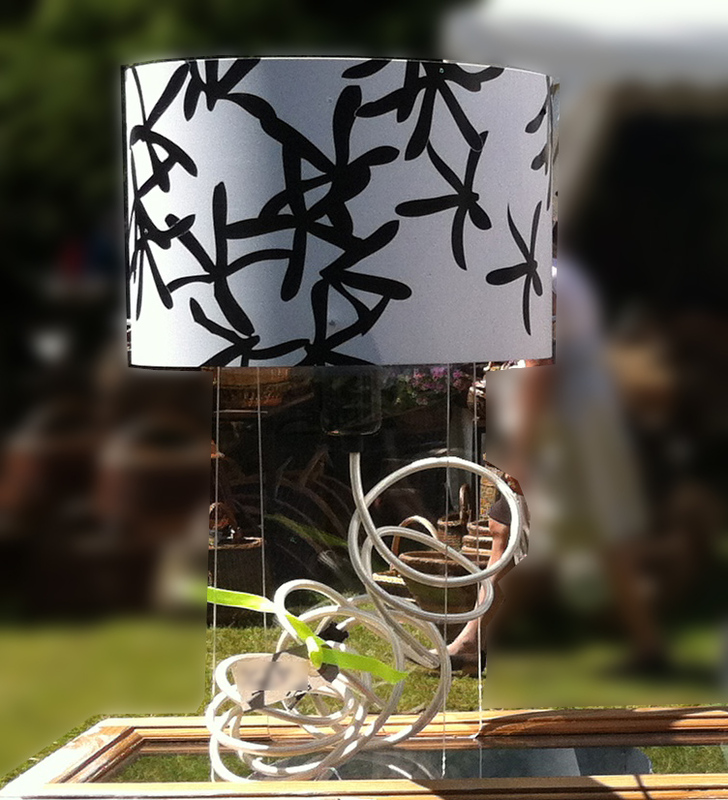 Here I go again, mixing materials with something unexpected – (recycled) pieces of acrylic with leather, rope, cord! This CLAIRELY upcycled jewellery collection is called CSR – so named because of the materials used to create this collection with UPCYCLED ACRYLIC. 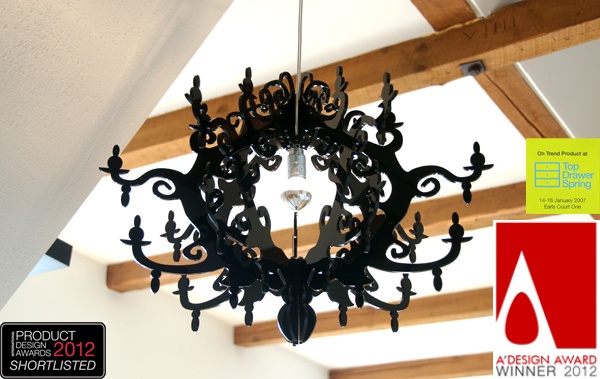 The pieces of acrylic are upcycled through careful and meticulous planning, from the waste of the production of my Claire de Lune Chandeliers. This collection is inspired by the unexpected invitation to participate as a member of the designer delegation chosen to represent Jamaica at LONDON FASHION WEEK Feb 2014. The collection represents a tapestry threaded together with colorful Cords, Strings and Ropes, it will be shown at the International Fashon Showcase, Thread Bare, a fashion show taking place at a reception at the Jamaica High Commission. Leather string wrap bracelets with upcycled acrylic tell stories – You and Me, Hearts, and other stories – these bracelets are called Stories Strung. Colorful ropes lend themselves to all kinds of combinations, the upcycled acrylic, they complete a striking neck piece. Cotton cords, finger crocheted make the basis for wonderful choker pieces adorned with upcycled acrylic, ready to adorn and dress up any T-shirt. 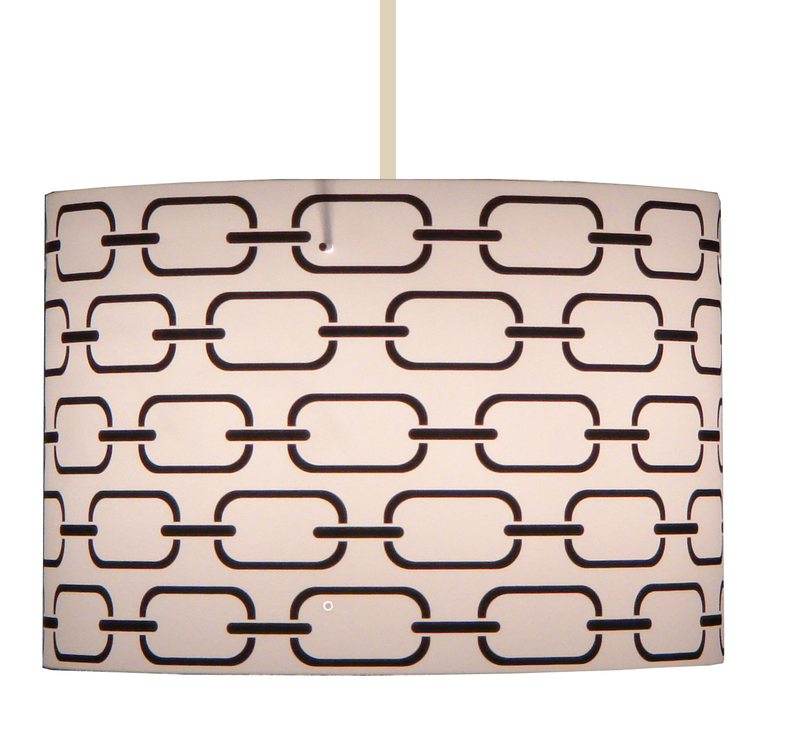 My work swings between semi-mass-produced and one-of-a-kind, trendy, timeless, and fashionable items. 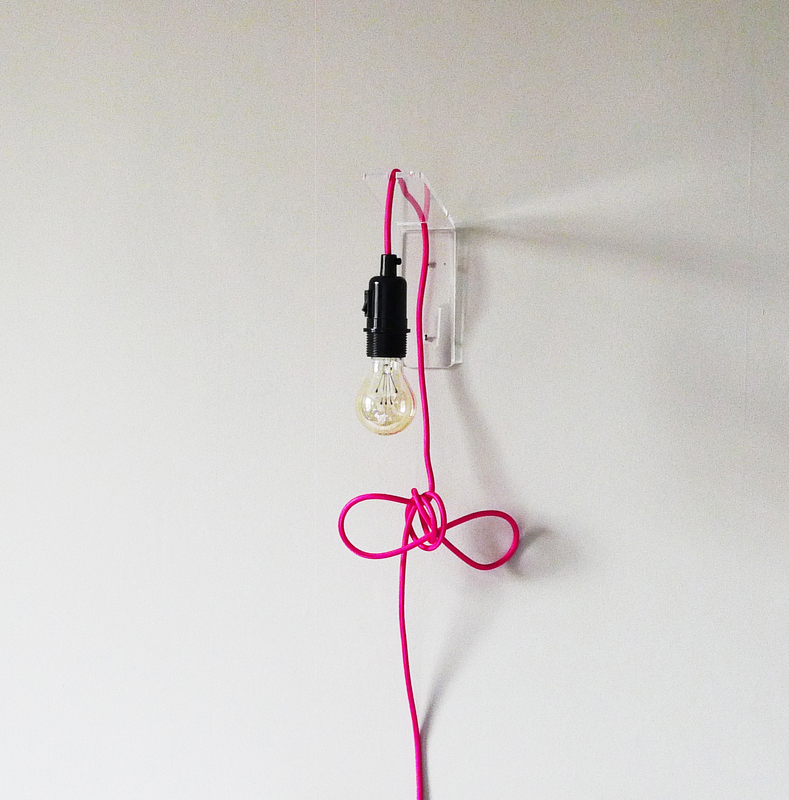 The jewelry and practical products I make are FUNKTIONAL (fun, funky and functional). (See www.accent.dk) A key consideration in my work is that I am very conscientious about the quality of materials I use and the attentions to detail. I am also very insistent on responsible disposal of whatever waste I cannot use in production. I create contemporary acrylic jewellery that reflects my influences, inspiration and identity. 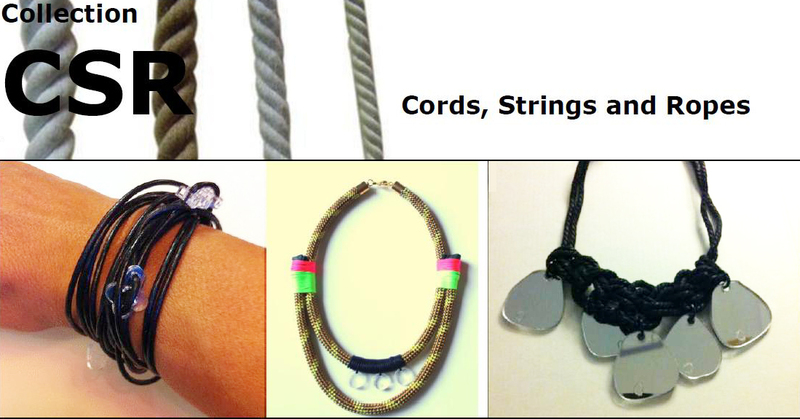 Through this collection CSR, I am inspired by the qualities that rope, cord, and string bring to my collections. 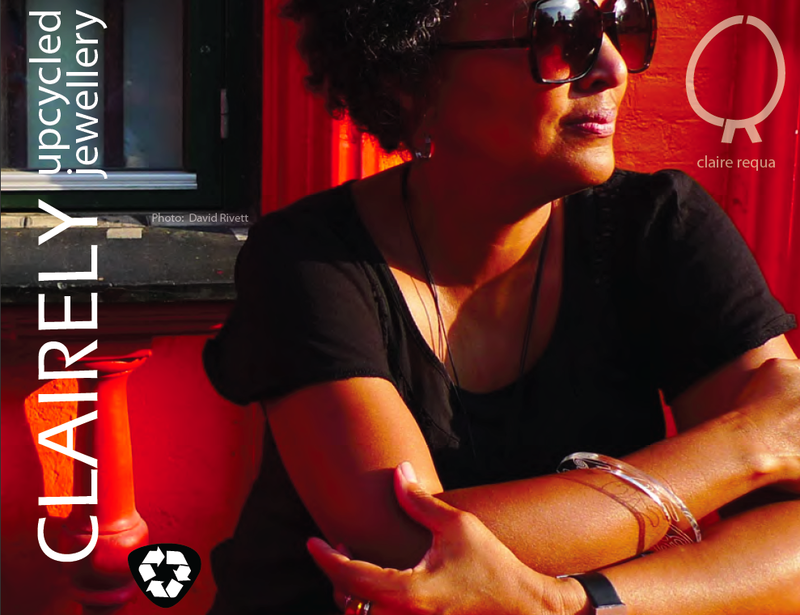 CLAIRELY upcycled jewellery has been featured in ELLE, Alt for Damerne magazine, (DK), several design blogs, and several times in the Observer (JA). You wanna come, don’t you? You are invited! LONDON FASHION WEEK is next week, from 13-18 February 2014. Our award-winning upcycled jewellery line – CLAIRELY – is off to London, with Accent products in tow. The IFS 2014 is an initiative of the British council and the British Fashion Council in parallel with London Fashion Week. The Thread BareShowcase where CLAIRELY UPCYCLED JEWELLERY will be part of a fashion show at a reception featuring Jamaican designers, is sponsored by the Jamaica Tourist Board, the Tourism Enhancement Fund with support from British Airways. The Jamaican High Commission is the host for the opening reception and fashion show. Organized by JBDC. You are invited to visit us at The Gallery, 32 Dover Street, London W1S 4NE, where we will be from 10Am til 6PM , 13 February through 18 February, this showcase will be open to the public. Finderskeepers is now – Saturday and Sunday. Here is how you can win a Barrel, maybe TWO Barrels. (Two Barrels together, matching or not, are great over a dining table, in a window sill, as bedside lighting, or separate. As you like). 2. ‘like’ our FaceBook page. If you do this via the internet (not in person at Finderskeepers), your name/email address will be added to the pool of entrants old-school style (on a piece of paper). Then at 6pm each day, we will draw 1 name from the pool, and the winners, if not present, will be contacted through their email address. Winners can collect their barrel at our stand on Saturday/Sunday, or Barrels will be sent by mail. Now to win TWO BARRELS – As a winner, if you send a photo of your Barrel that we can use in our marketing , we will send you another Barrel of your choice. See you later this weekend. 1-5 June in Frederiksberg’s beautiful gardens with entrance on Falkoner Alle, we will be there, exhibiting at Mit Slot Mit Hjem (My castle, my home). Along with many other exhibitors with products for your home and garden, we will be there with our new products, which we will keep secret for now, and then there will be the ones you remember. 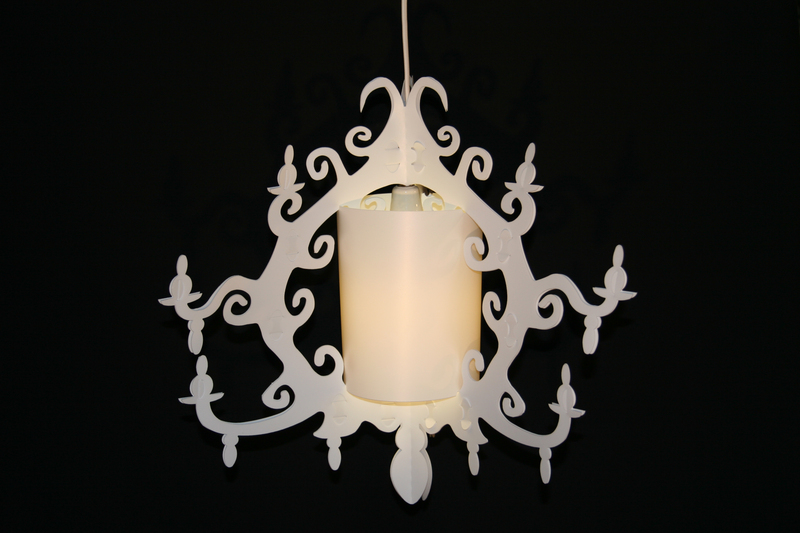 We will be in the same booth with Salamat Interiors with her lovely products from India. 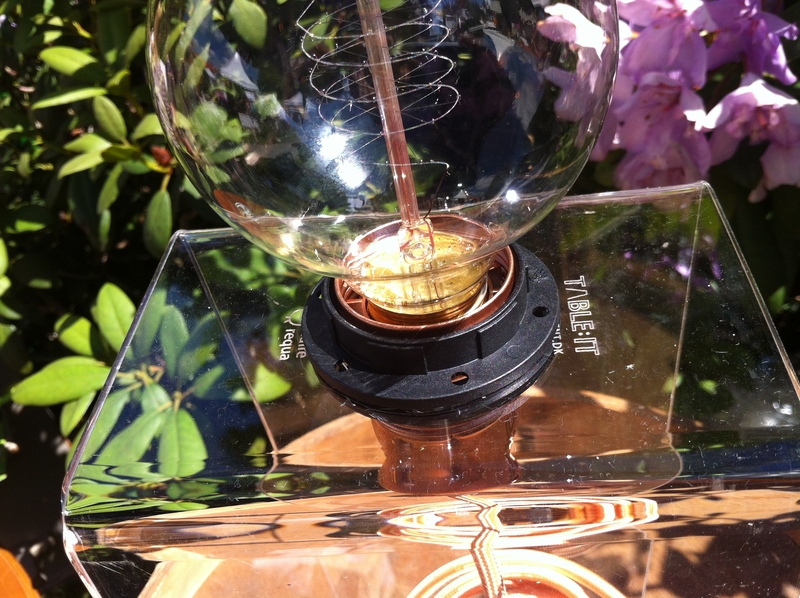 Launching our mirror lamp in a smaller version. 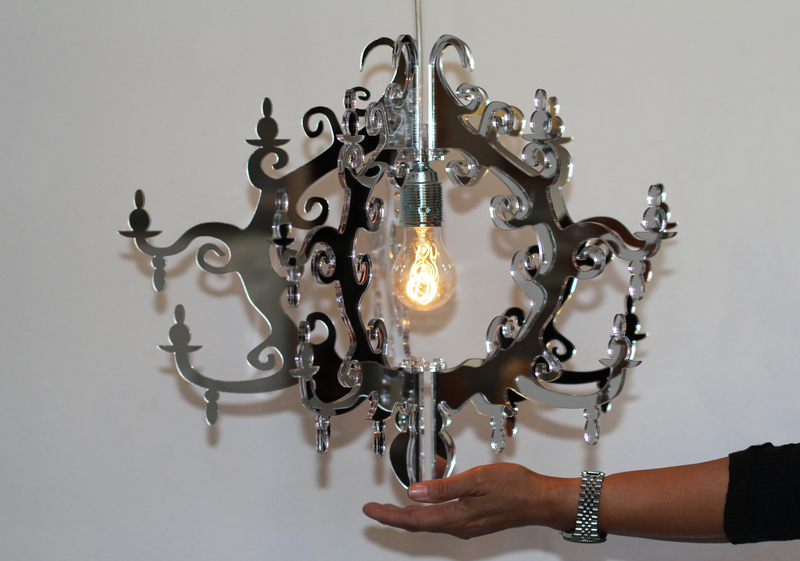 Now you can have all the glamour and luxury that is in the BIG chandelier in a smaller version, just right for your bedroom, bathroom, living room, or boudoir. A wonderful thing happened last month. 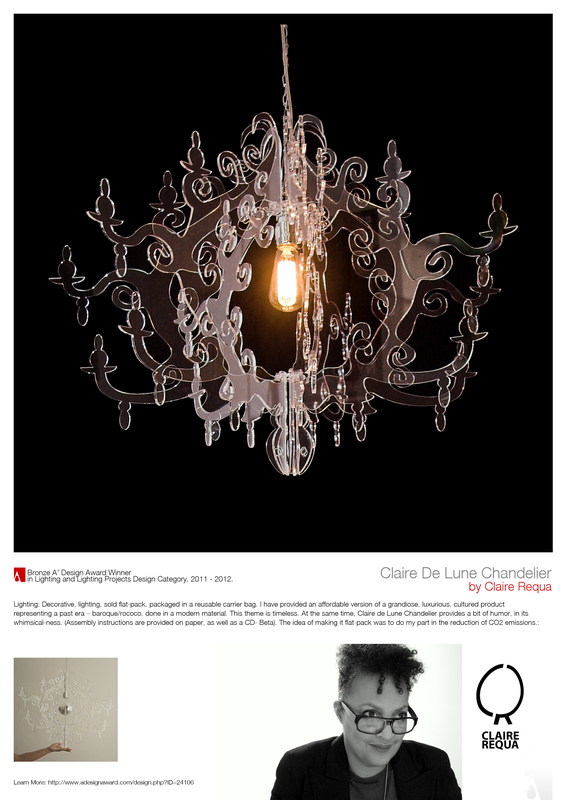 A’ Award and Competitions are pleased to share that the project Claire De Lune Chandelier has been honored with the prestigious Bronze A’ Design Award at Bronze A’ Design Award Competition elected as one of the winners by the international arbiters of the A’ Design Awards & Competitions amidst numerous participants. The Bronze A’ Design Award is a prestigious award given to top 10% percentile designs that has achieved an exemplary level of sublimity in design. The designs are judged by a panel of three different jury which is composed of 5 Academic, 5 Professional and 5 Focus Group Members. The designs are evaluated with score normalization to remove any biases and are voted on aspects such as functionality, ergonomics, engineering, presentation, innovation, usability, fun details, technology, and any other specific points that could be considered, each of these points are further weighted for different jury groups. A’Design Award and Competitions, aims to highlight the excellent qualifications of best designs, design concepts and design oriented products. A’ Design Award and Competitions are organized and awarded annually and internationally in a multiple categories to reach a wide, design-oriented audience. 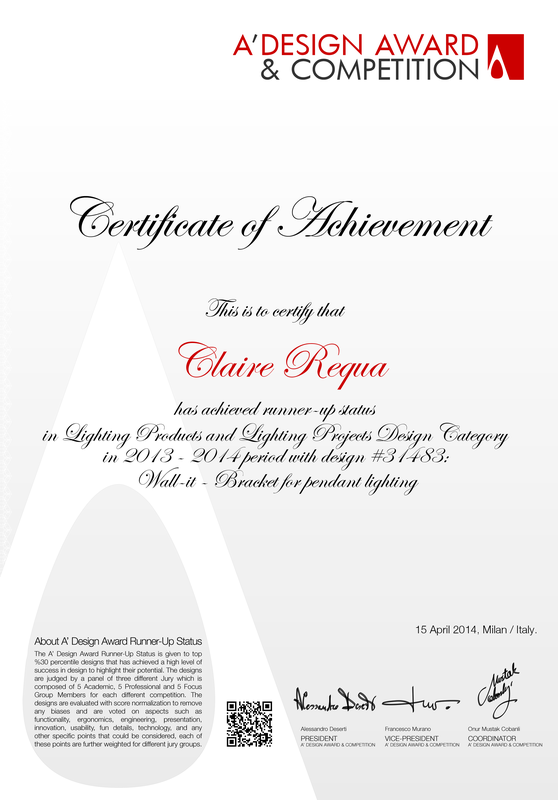 ADDRESS: A’ Design Award, OMC Design Studios SRL, Via Rodari 9, 22100, Como, Italy.